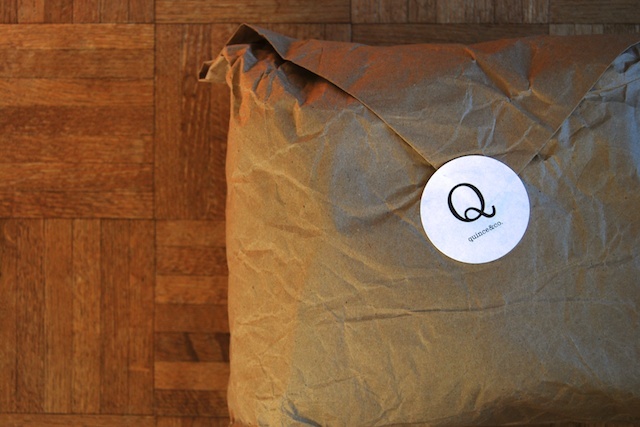 Today I got my much anticipated package from Quince & Co. It was like Christmas morning. 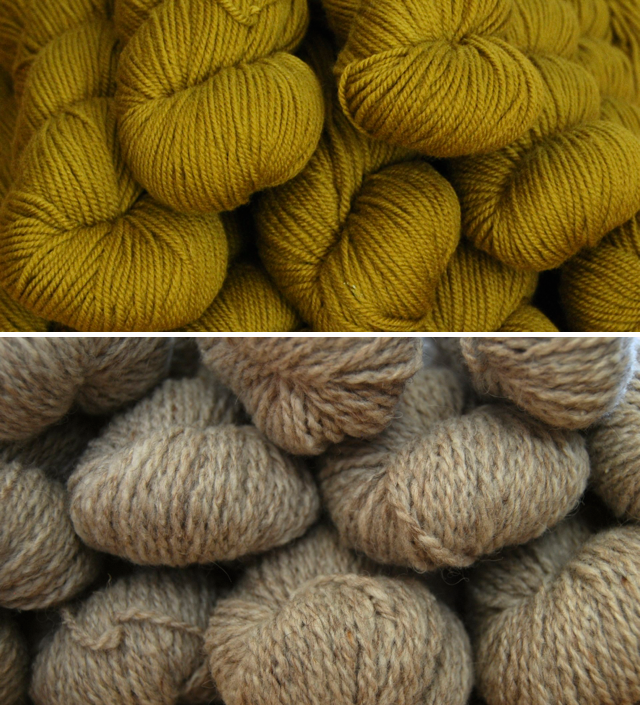 Although I have a sweater for my mother-in-law on the needles right now (more on that later), I've already started swatching with the honey colorway for my Aureus. In fact casting on for my swatch was the second thing I did after ripping open the package - the first being to lay out all my yarn on the floor and touch / admire / photograph / oooh and ahhh over it for awhile. This is the most yarn I've ever purchased at one time and I am really excited by it. This is my first time using Quince & Co. yarns, and I've already been won over by my swatch. It's springy and lush and knitting up so evenly, I can't wait to feel it after blocking. The Aureus gauge is taken from a needle size 6, and I had already cast on to a rosewood needle when I remembered something I read in this incredibly helpful Fringe Association post earlier today. Even though my gauge isn't being measured across cables, it is definitely true that I knit far tighter on wooden needles than on metal. I was only preparing to swatch on wooden needles because my size 6s were being used for the other sweater - I knew I wouldn't knit a whole cardigan with anything other then my trusty Addi Turbos. And here we find another example of what an incredibly lucky gal I am: last year for my birthday my darling husband gave me the Addi Turbo long tip lace click set, so even though both sweaters call for the same needle, it takes just a few seconds to switch out the tips from one project to the other. Voila! Two sweaters simultaneously on the same needles? Not a problem. 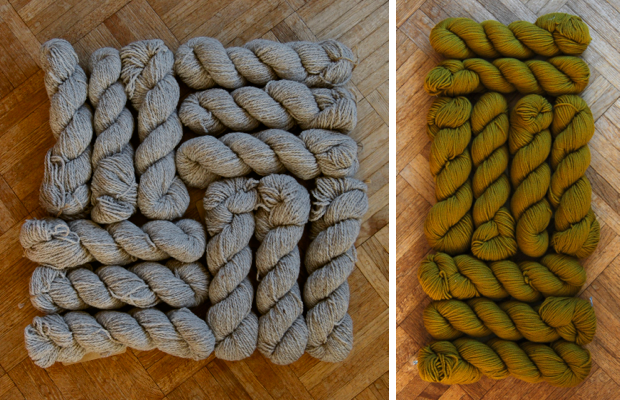 Wow you guys, I hadn't realized this had turned into such a technical knitting blog lately. Apologies to those of you who don't come here for that express purpose (hi, mom!) but in our current nomadic lifestyle, the portable nature of knitting has made it my main focus. This is the longest only time I've truly been unemployed in 10 years, and I'm determined to enjoy it. 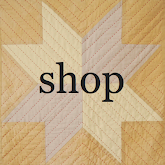 While there are so many hobbies I love (too many hobbies, really), outside factors are playing a role. There's reading - I have been doing a lot of reading. Then there's running. It's been really hot where we're staying: over 95 degrees most days this week. This means long distance running can really only happen during one of two times of day: early in the morning or late in the evening. During one of those I'm sleeping, and during the other I've usually had an enormous meal and a glass or two of wine. Okay, so, running is out. I know, I know - tough life, huh? And then there's, well, blogging. To be honest with you - I'm sure I've said this before - blogging isn't something that has come naturally to me. I haven't wanted to do it so much as regularly feel obligated to do it, and it's often a long painful process to actually put a post together. Yet since I've left my job, I find myself wanting to be here, and inhabit this space. Sharing projects, absorbing information and inspiration from you all - whatever the reason, I am really enjoying my presence here. So here I sit at 2am, typing gleefully away about my new armload of yarn, my swatch gauge, etc, and I realize that this is my 100th post. One hundred times I have shown up at this tiny corner of the internet, to talk about everything from crafting to camping, kombucha tea experiments to friend breakups. And you know what? I am really happy to be here. Almost as happy as I am about two new sweaters' worth of yarn. and i'm so happy i found this space! great choices in color....that's always my biggest problem with ordering for Quince&Co....the colors are all so scrummy I have a hard time decided. You did good! 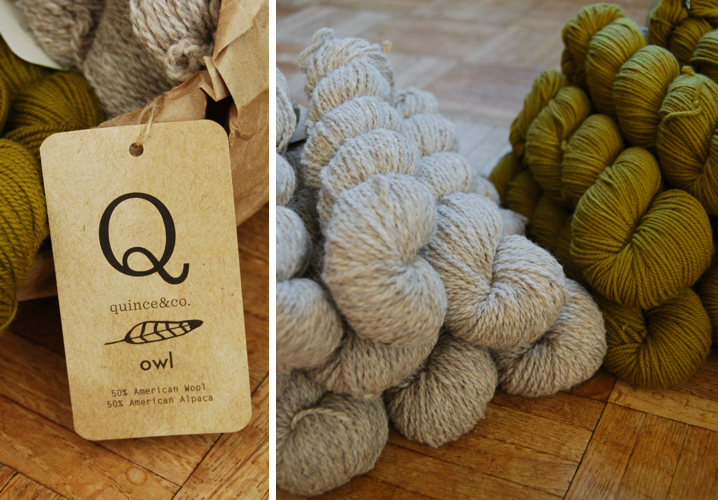 I adore Quince & Co yarns, but as I'm in the UK can only really afford the import duty on a few skeins at a time so a whole sweaters worth is out of the question and I am green with envy looking at your wonderful haul. Hope you're soon settled after your move and get all that fabric back.